It’s three years ago today that my favourite band took to the stage for the last time in the grand setting of Madison Square Garden, NYC. 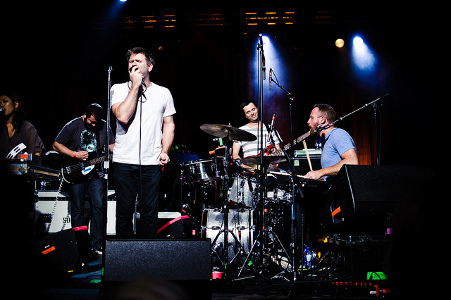 LCD Soundsystem’s demise was a bit of a surprise to many, after releasing three fantastic albums to critical and commercial success – but they left fans with one of the most epic finales a band has ever had with that concert. Although I wasn’t there, the MSG concert helped cement the band’s status as my favourite. I first heard an LCD song in 2008. As I recalled in my pre-review for GTA V, the launch trailer for Grand Theft Auto IV included a catchy track in the background whilst the main character strutted around an homage to New York City. I liked it on first listen. There was a simple but captivating electronic build-up in the background, and then a drone-like repetition from a woman of “You can normalize; don’t it make you feel alive”. It was something special. In my early experiences with online music, I searched the web for what this tune was. It was “Get Innocuous!” by LCD Soundsystem. Little could you tell from the advert, but the song was a 7 minute 11 second masterpiece. It takes about 1 minute 30 seconds for the drums to kick in, for reference. In a world full of short, poppy, nonsense music – this was a revolution. The build-up took minutes, then the drums came in, the verse came in, then the chorus and then a two minute wind down. It was a miniature opera, complete with violins at the end. I absolutely loved “Get Innocuous!”. And then I found there was so much more. I casually browsed YouTube and found other LCD songs that were certifiably brilliant. “Losing My Edge”, “Yeah”, “Someone Great” and “All My Friends” spring to mind. All these little songs really were a great addition to my iPod, but they still weren’t my favourite band at that point, an honour that went to The Killers. I didn’t have a full LCD album yet, and little did I know, that the songs that I had were only half of the finished product. “Get Innocuous!” remained my favourite LCD Soundsystem song until well into 2009. I’d give all of the others a customary enjoyable listen, but nothing quite compared to the grandeur of the first song I’d heard. A simple lyric search changed my entire attitude towards the band, and a lot more in consequence. It was “Someone Great”’s lyrics that I searched for at one point that year. The meaning of the song was puzzling me, and I was looking for guidance on what some of the lines actually meant. I didn’t find a definitive answer to my question; LCD’s central influence James Murphy has never clarified exactly what the song is meant to mean, but I did discover that there were extra verses that I’d never heard before. How could this be? I went back to my source at YouTube and found that the version of “Someone Great” that I’d heard, which was the official video version, amounted to nothing more than a radio edit. There was another two minutes of the song that I’d never heard before. Rarely do you ever get the chance to listen to a song for the first time again, but that day I did. The song enveloped an entire new meaning behind the childish glockenspiel that plays through the song. The song that I’d enjoyed before became one of my most cherished in little over six minutes. I had a similar reawakening with each of the other LCD songs I’ve mentioned so far. Little verses, hooks and more hidden behind edits. The one song I remember most vividly listening to again was “All My Friends”, a song where Murphy looks back on his past with longing but no regrets. It spoke to me so much in a time where I was beginning to understand that my childhood was nearly over, and that the friends I had might not always be there – with university on the horizon. It is still, undoubtedly, my favourite song. With every passing year, the feelings and message of the song becomes more and more true and profound. LCD had then become a strong contender for my favourite band, but not quite on the level of The Killers. It was 2010 before LCD Soundsystem really took that honour, with the release of their third and final album: This Is Happening. I didn’t really know much about the release of the album until one of my friends mentioned that they’d seen an LCD song on the music channels. I thought it was strange, and through online research I’d found that they’d released a new single: “Drunk Girls”. Imagine my delight when I learned that it was the first single from a new album. “Drunk Girls” is as much of a pop song as LCD Soundsystem can do, and I enjoyed it – but when the album came out during my pre-exam study leave, I heard the epic songs that I expected from the band I’d come to love. The opener “Dance Yrself Clean” is well over eight minutes long, with a slow intro of drums and quiet vocals. But then the beat kicks in and it’s an unforgettable experience packed with funk and anguish. It’s an absolute tour-de-force, and then there are another eight great songs on the record.